Born on 27 October 1997 at Mumbai in India, Sarfaraz Khan is a right handed middle order batsman and a leg-break bowler. He is probably the most popular uncapped young sensation of the nation who became known among the masses during his IPL tenure with RCB. Born and raised in the suburbs of Mumbai, the lad was trained under the tutelage of his father and coach Naushad Khan, who was also a well-known cricketer in Mumbai in his days and was responsible for discovering talents such as Iqbal Abdullah and Kamran Khan. Sarfaraz played for Mumbai and later in 2015-16 season, he went to play for his father’s home state, Uttar Pradesh, in domestic circuit. Sarfaraz made his debut in List-A in a match against Saurashtra in Vijay Hazare Trophy 2014. His unbeaten 17 off 15 balls led the team to victory in the close game. Few months later he played his debut First class cricket in a match against Bengal in Ranji Trophy 2014. He failed to impress as his 1 run was the least individual score of the entire game. Sarfaraz was destined to glory, as his stats reveal. In total of 11 First class and 12 List-A matches, he scored 535 runs at a thumping strike rate of 64.45 in the former and 257 runs at even better strike rate of 96.25 in the latter. Due to these eye-catching stats, he earned a call-up for the India U19 quadrangular series in 2013, to which he responded with a match-winning 66-ball 101 while chasing against South Africa. 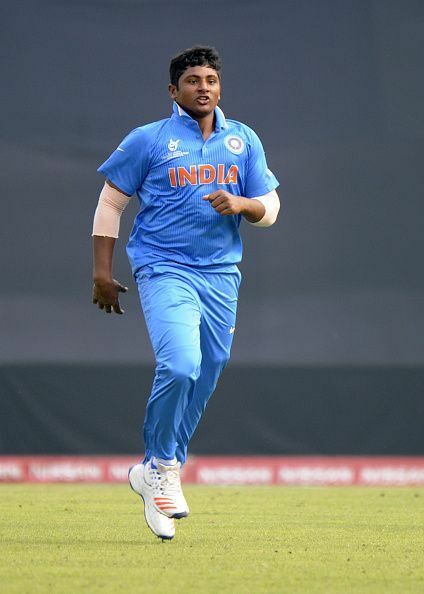 Sarfaraz was then rewarded with a spot in the India squad for the Under-19 World Cup in UAE in 2014. Famed as much for his unyielding will to win as his unrivalled skill and composure, the aggressive batsman earned records galore over the course of an illustrious career, one of which is the record for the highest score in the Harris Shield inter-school tournament, making 439 for Rizvi Springfield in an innings that featured 56 fours and 12 sixes. Having scored 211 runs in six games at an average of 70.33 in U19 World Cup 2014, Sarfaraz again broke the headlines of the national media. He again represented India in U19 World Cup 2016 and this time Sarfaraz elevated his calibre even more as he finished as the second-highest run-scorer of the tournament, with 355 runs from six matches, often rescuing India from faltering starts. After his scintillating knock of 439 at the age of 12, Sarfaraz faced controversy for fudging his age and was suspended by the Mumbai Cricket Association before they eventually accepted the result of an advanced test. Soon after, he was dismissed temporarily from the MCA's indoor academy camp on disciplinary grounds. In 2015, Royal Challengers Bangalore bought him for INR 50 lakhs, and he soon became the youngest player to play in the IPL. His 45 unbeaten off 21 balls in a match against Rajasthan Royals in 2015 was a pure aggressive class. He had played 18 games for RCB and amassed 177 runs at an whooping strike rate of 173.52. This consistency of him made a very valuable asset of the team and they retained the young lad along with the likes of Virat Kohli and AB de Villiers for the IPL 2018.